One of the oddest quirks in our homes is that we flush toilets with water good enough for drinking — and toilets consume on average 40% of a household’s water use. To address this issue Sloan Valve Company has been hard at work perfecting the AQUS water reclamation system, which takes your bathroom’s sink water and recycles it for flushing in your toilet. As a do-it-yourself project the kit takes about 1 hour to install and promises to save up to 6,000 gallons each year. Other than perhaps saving water in a bucket, the Aqus provides the simplest and most effective solution to reducing our water footprint — and it has garnered a lot of attention for its innovative design. Grey water has been a colorful topic in sustainable building because of the significant impact our water use has on the environment. Now that clean water supplies are at more risk than once assumed, we need to make every drop count. It also takes a significant amount of energy to distribute and process drinking water and waste water through an aging system. Sloan’s AQUS system is built around a box that rests inside the vanity and holds up to 5.5 gallons of reclaimed sink water. 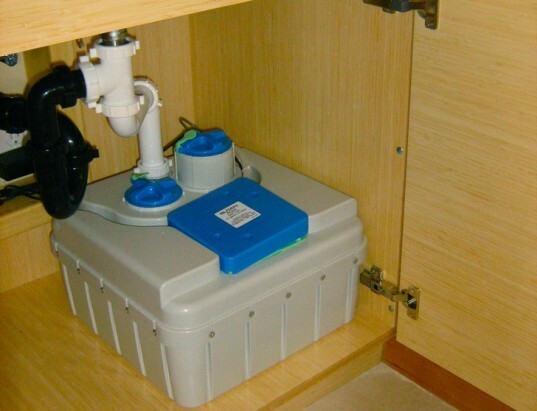 A small pump, activated by a water level sensor in the toilet tank, transfers the grey water to the toilet and fills the reservoir alongside the toilet’s water supply, off-setting 65% of the potable water needed per flush. If the Aqus is out of water, the toilet’s regular water supply fills the tank, and if the Aqus is full, excessive water goes through the normal drain. The system also requires maintenance only once a year, reducing the complexity and improving the safety of using grey water. 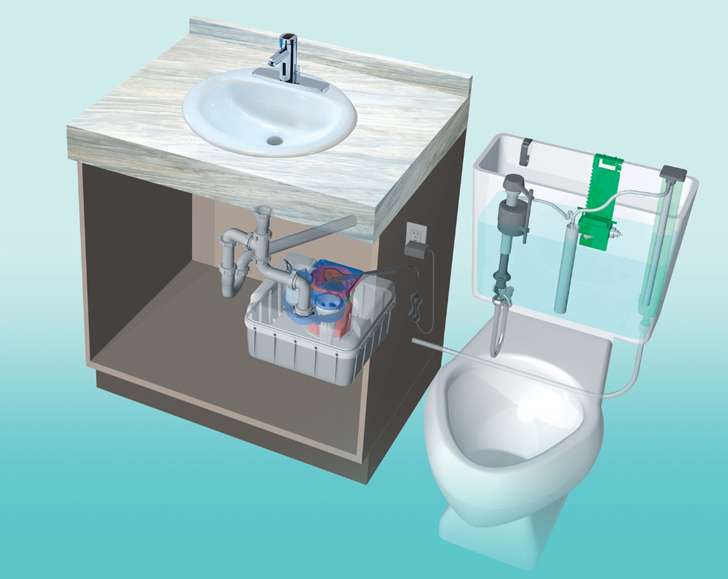 The installation is sold as a kit that includes the hose and sensor wire to run from the vanity to the toilet, some equipment installed in the toilet tank, and some plumbing from the sink to the storage tank. The entering sink water pours through chlorine tablets, which are inserted to make sure the water is not dangerous, and a screen catches hair and other objects. A plug in the vanity is also required to power the unit. Payback depends on your location, but since many municipalities charge for waste water processing, it could take just a few years for the AQUS to pay for itself. Those on septic systems can reduce the stress and potentially extend the life of their leech field. The system gives green building designers an easy way to reduce a project’s water consumption without complex and expensive engineered designs. The system is also viable for hotels, office buildings and other commercial projects that use gravity-type toilets, including super low flow and dual flush types. Based on my experience. Sloan 5.5 gal is way under capacity for toilet flushing. For two person, min of 20 gal is needed. My 25 gal model is just good for the purpose. 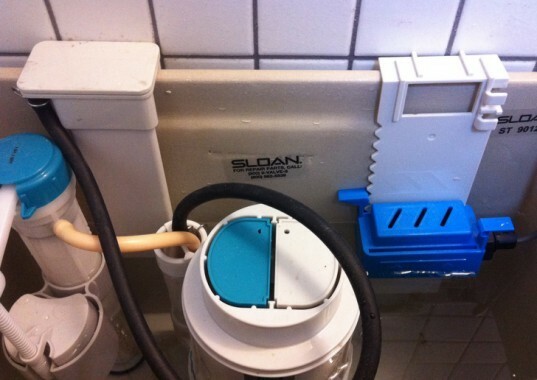 If Sloan eliminates the water adjustment inside its tank will be easier for user. Since most homeowners are unable to perform this type of task. The Sloan system is a great idea. But need training to complete the installation. Does anyone know where we can get one of these now? Should use the water used in the shower. Nice concept however sad considering all links in this article are dead. Either the manufacturers are out of business or whoever manages their Website knows nothing about SEO and correcting 404's. What is the maximum distance between the gray water tank and the toilet tank? Are there plans to make larger systems? I've seen a setup I prefer, where the sink is located on top of the toilet tank so the water drains in the tank automatically. I would invest in a sink that fits over my tank before one of these because it is more efficient and the space it takes up is usually unused anyway. Nice idea... but what is the power consumption of the pump motor to fill cistern for complete flush? What a brilliant idea! Something simple and easy to install that any homeowner can use. Wish there were more products out there like this. Going green wouldn't seem like such a big undertaking. For $189, the AQUS was designed to usher in lots of kinds of water reuse. It's Plug-N-Play design was intended to get a larger population thinking about reusing water. I came up with the idea when I was 9 years old, patented the first prototype in 2000(30 yrs later). 11 yrs after that, people seem to be ready for a system like the AQUS. This is a great solution for retrofitting existing toilets. While there are other solutions that will help you to reduce the amount of water needed per flush, this goes step further by recycling water already in the house. This remninds me of the Dyson strategy. Go to Japan. Find a successful, well incorperated technology. Return home. Sell it as your own revolutionary idea. It is a great water saver though, we should also by using the system for washing machines. great system. would love to have these in my parents house where we have 4 toilets flushing away tons of clean water. One of the oddest quirks in our homes is that we flush toilets with water good enough for drinking -- and toilets consume on average 40% of a household’s water use. To address this issue Sloan Valve Company has been hard at work perfecting the AQUS water reclamation system, which takes your bathroom’s sink water and recycles it for flushing in your toilet. As a do-it-yourself project the kit takes about 1 hour to install and promises to save up to 6,000 gallons each year. Other than perhaps saving water in a bucket, the Aqus provides the simplest and most effective solution to reducing our water footprint -- and it has garnered a lot of attention for its innovative design.